This wireless room thermostat from Celect is simple to operate with an intuitive push button up/down digital temperature adjustment. The DRF1 thermostat model can be used with any condensing or combi boiler and has a wireless 20 Metre range. The Celect DRF1 Simple Wireless Room Thermostat will replace most common residential thermostats and can be used with electric, gas or oil heating (or even cooling systems though much less common in the UK). Unlike most standard single unit type thermostats, the DRF1 Wireless Thermostat is a new type of thermostat which separates the thermostat function into two distinct units: the receiver and the control centre. 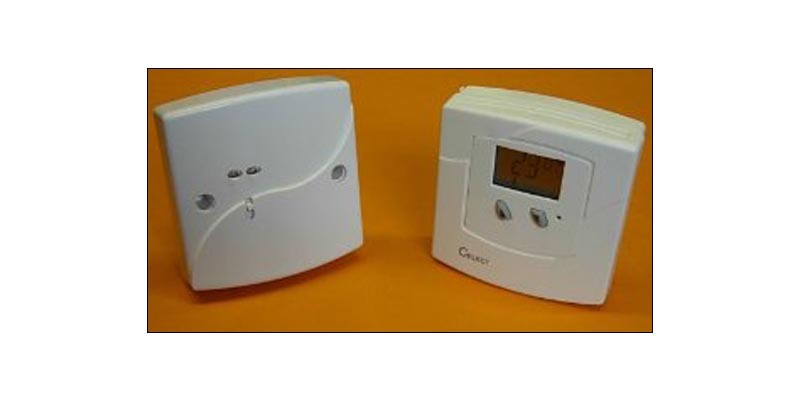 The receiver is used for wiring connections and wired controls and is the interface between the thermostat and the boiler, but the thermostat can be placed in any room in the house up to 20 metres away without the need for any wiring back to the receiver. Temperature adjustment is digital and straightforward, as the displaying system is available which will allow the system to work efficiently with multiple wireless thermostats in close vicinity. The receiver unit comes complete with a surface mounted wall box so you have everything you need to set up wireless control and monitoring (with the exception of the AA battery for the thermostat). The wireless connection uses the 433 MHZ Frequency band so will not interfere with any other wireless equipment which use the 2.4Ghz band as standard. Room temperature setting can be digitally selected from 5 to 35 degrees Celsius. The receiver and the thermostat are both plain white so should match most decor, while the dimensions are compact so the thermostat can be placed almost anywhere without being an eyesore.